Ideas for hosting a celebration for your infant. 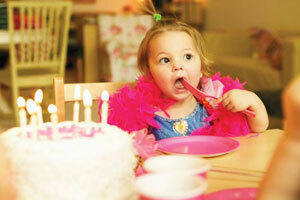 An infant’s birthday is a major milestone in the baby’s and the parents’ lives. Traditionally speaking, most infants’ birthdays are celebrated with family members, including grandparents and cousins. But families with ties to mommy groups, parent-child activities and baby playgroups often celebrate with friends and the little one’s peers. Either way, it’s helpful to choose a theme and arrange the party around it. Here are a few ideas and pointers for celebrating that special first, second or third birthday with your child. Play a game of Pop the Bubble. Have adults blow bubbles that the kids try to pop. Inflate balloons, toss them in the air and encourage babies to catch them. Hire a balloon magician to make animal shapes that kids can take home. Tie a string to a balloon and let it sit in the middle of the room. Pull the string and watch the babies go after it. Decorate with Sesame Street posters. Tie helium balloons to Sesame Street characters and let the friendly folk float around the room. Cut out large footprints from yellow construction paper to resemble Big Bird’s footprints. Set the prints around the room in a path, leading little ones to follow in Big Bird’s footsteps. Get Grover. Tie a rope to a stuffed Grover and place him in the middle of the room. Have the babies take turns trying to get Grover, as you pull the rope just out of reach. After a couple of tries, let the kids catch Grover. Have plenty of Grovers or other characters on hand, perhaps using the ones tied to balloons, for babies to play with and share. Stage a puppet show. Use stuffed Sesame Street characters to put on a lively show for the babies. Set out instruments for babies to experiment with during the party. Add to the musical adventure by playing fun CDs to inspire the babes as they work their magic on the instruments. Even better, host a concert. Give each child a musical instrument. Let them play along to kiddie tunes, marching around the room if they’re walkers as if in a musical parade. For a baby version of Musical Chairs, set out mats for the babies to sit or stand on. Start the music and coax the babies to dance around in a circle. When the music stops, have the little ones find a mat to stand on. Do not remove any mats though. Babies won’t understand, and they’ll enjoy the game without playing the official way. Seat the babies in a circle and sing a favorite song, such as “Twinkle, Twinkle Little Star” or “Happy Birthday to You.” If you know baby sign language, add that to the song. Decorate inflated balloons of animals using permanent markers, construction paper or inexpensive masks. Float the adorned balloons around the ceiling. Buy animal masks to let kids wear them at the party. Be sure to have a mirror handy so they can see themselves. Another option is to hire a face painter or get infant-safe supplies for painting children’s faces to resemble animals. Make animal noises and have the babies name the animal. Hire an animal trainer experienced with children to bring an animal to the party, such as a rabbit, hamster or turtle. Have the trainer allow each baby to gently touch the animal. Keep the party short and sweet for babies and young children. An hour or an hour-and-a-half party is usually sufficient. Plan the party for late morning or late afternoon, when babies are not too tired. Invite parents to attend to ensure babies stay safe, also allowing adults to take pictures and enjoy the fun. Get extra help. Hire a babysitter or two to assist you with the party hosting. Coax the babies to remain busy, preventing them from becoming bored or whiney. However, don’t overwhelm infants with activities; keep it simple. Designate an extra room where fussy infants may take a breather with mom or dad. Keep playthings and pillows for babies in the room as accessories to pacify children who need extra attention. Serve food that fits the party theme or at least caters to the needs and tastes of babies and adults. Give a baby-friendly treat as a favor. Remember that babies love balloons. You can use a Balloon Time Helium Balloon Kit, available at party stores, to make inflating colorful balloons easy and inexpensive. Just be careful not to let babies younger than age 2 play with broken or deflated balloons as they are a choking hazard.